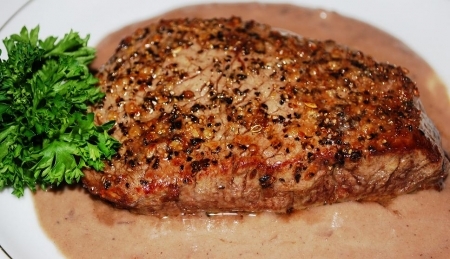 This is a different take on the traditional Steak Au Poivre. The traditional recipe calls for quite a bit of different peppercorns that I feel is a little much, so I replaced them with McCormick’s Montreal Steak Seasoning. However, if you like the peppercorns, please feel free to use them instead of the seasoning that I selected. I almost always use port instead of red wine, because it creates a more robust sauce. The sauce is very rich and creamy that you will want to pour over the side dishes so keep them simple! Serves 4 or cut ingredient amounts in half for a date night dinner. Season tenderloins on one side with seasoning. Melt butter over medium high heat in a large cast iron skillet or regular skillet. Make skillet is hot before adding filets so they will get a great sear. Sear seasoned side of steak first for about 3 minutes. Sear other side and transfer to a baking sheet seasoned side up. Set steaks aside. They will not be done, but we are going to continue to cook them in the oven and have them come out at the same time as the sauce is done. Do not refrigerate filets. Moving on to the sauce, add shallots to the skillet and cook over medium heat until soft about a minute. Add Cognac to deglaze the pan and scrape up bits. Add port and beef broth and turn heat to high, reduce sauce in half, about 30 to 45 minutes. Stir occasionally. While the sauce is reducing, this will be the time to broil your filets, so they will be ready at the same time as the sauce. Broil steaks on low for about 15 minutes, turning once half way through. This will result in a steak done to medium. Increase or decrease cooking time, depending on your preference. Remove from oven and turn steaks so that the seasoned side is up and tent with foil. Allow tenderloins to rest for about 10 minutes. The sauce should be reduced at this point. To finish sauce reduce heat to medium and whisk in cream and mustard. Make a thickening agent by whisking cornstarch and water. Turn heat to high, when sauce is bubbling, slowly add thickening agent until sauce has thickened. Sauce will not thicken until brought to a boil. Serve sauce on the side or pour over tenderloin. Keep the sides simple becasue you will want to pour the sauce over them! Try Classic Mashed Potatoes and fresh steamed aspparagus. Try Beringer Founder’s Estate Old Vine Zinfandel (California), Bogle Vineyards Old Vine Zinfandel (California), Rosemount Shiraz (Australia), Stag’s Leap Wine Cellars Artemis Cabernet Sauvignon (Napa Valley) or Becker Vineyards Iconoclast Cabernet Sauvignon (Texas).